Supergirl devotes an episode to Lex and the Kara duplicate created at the end of last season and teased throughout this one. The Kasnian Kara plot has received such limited focus this season that I thought the writers had largely forgotten about it. 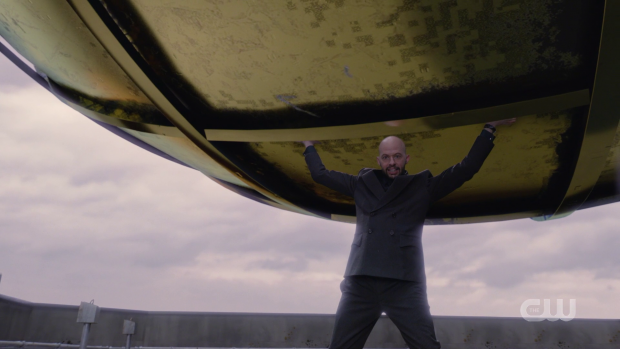 It came across as a relic of a plan that had been abandoned in favour of something else but this episode attempts to give the plot context by attaching it to the recent appearance of Lex Luthor. There’s no denying that some narrative gymnastics are at play to make this whole thing work and it more or less does outside of a handful of head scratching moments that strain credulity. Characterising Lex Luthor as the mastermind behind the scenes looking to use the Kasnian’s to reignite the Cold War for his own ends feels right as it’s a classic portrayal of this character and Jon Cryer does an excellent job portraying that. His scenes with the alternate Kara -whom he dubs Snowbird and later Red Daughter- are excellent because it shows how amoral Lex Luthor is and how relentless he is in pursuit of his goals no matter what gets in his way. Flashing back to his trial where Lena testified against him is a clear showing of how he views the rest of the world. He sits casually scribbling in Kryptonian barely listening to his fate being decided and scoffs at the notion of a jury of his peers because he sees everyone else as being beneath him. As far as he’s concerned he has no peers so the legal proceedings are unworthy of his full attention. To make this point clearer he poisons everyone in the courtroom out of casual spite before accepting the sentence that has been placed on him. It’s a great showcase for Lex’ perspective on the world he lives in and makes it clear he considers prison to be more of an opportunity than a setback. This idea is reinforced later in the episode when he plans to use prison as an alibi to divert suspicion away from him while he executes long form schemes that touch on the main narrative beats of this season. Revealing that Ben Lockwood is an unwitting pawn in his grand plan makes a lot of sense and sets up a scenario where Ben could be less than impressed with the lack of control he actually has over what he thought was his agenda. Connecting Lex to this through Otis and Mercy who acted as proxies on his behalf to encourage Ben Lockwood to be more extreme in his methodology is a clever idea that highlights Lex’ ability to be in control without direct intervention. 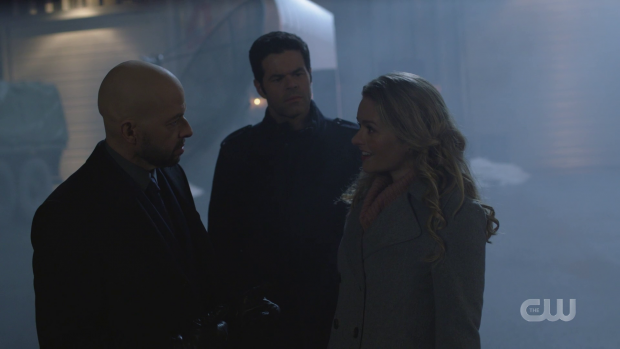 This episode offers a little bit of context to the reveal from last week that Eve has been working for Lex all along though it’s far from the strongest reasoning. Eve is a character who has been recently defined by being constantly misunderstood. Lena takes notice of her because she’s clearly a genius and brings her onboard to work with her which turns out to be the perfect place for Eve to be of great use to Lex. Framing her motivation for doing this as being because she’s a Lex Luthor fangirl is limiting and insulting to the intelligence that has been built up. She doesn’t lose that as such but I would have liked to see her working with Lex for her own reasons outside of greatly admiring him. 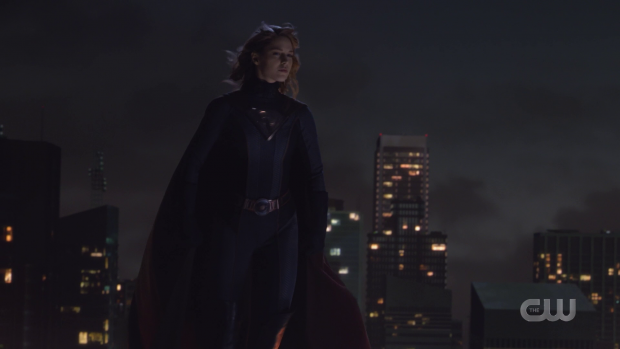 Despite this, the character is used really well her with her presence at a lot of the significant moments in the development of the alternate Kara helping to link back to the season as a whole. Her relationship with Lex is interesting as she is clearly his subordinate but isn’t shy when it comes to voicing her own ideas and pointing out where she could be of better use to him. It’s not something the episode does much with bit there is the suggestion that Eve doesn’t blindly follow Lex which makes the note she leaves for Lena an effective cliffhanger as it’s more than likely she has her own agenda that can be played with. The real meat of this story is Lex grooming the alternate Kara with his own outlook on the world to make her a loyal resource that he can eventually call on. He takes a measured approach to teaching her about the world he lives in and manipulates the narrative so that she will conclude what he wants her to conclude. It’s a very subtle sort of brainwashing that relies on her being dependent on him and sets her up as being something of a tragic figure as her life has been built on lies. This manipulation begins when he is able to take advantage of Alex being the only name she remembers from the person she splintered off from. He uses the similarity to lie about them having a history and plays on that in order to gain her trust. This could be seen as a riff on the infamous “Martha Moment” from Batman V Superman: Dawn of Justice though this is a far better example of that sort of twist as it makes better use of Kara’s foundational relationship and offers a clear opening for Lex to exploit. Interestingly the Red Daughter isn’t simply an “Evil” Kara. She’s still clever and hasn’t lost the innate empathy that defines Kara as a person. The most significant example of this is her attachment to the young boy Mikhail (Gabriel Gurevich) after she instinctively saves him. Even though she has no idea who she is or how to control her powers the desire to help people isn’t easily suppressed and it becomes yet another thing for Lex to manipulate as he can skew her perspective so that the “right thing” in her eyes connects to exactly what he wants. There are a lot of interesting flourishes to her character that feel familiar to the Kara that viewers know while being entirely distinct. Lex frames the United States as being rife with greed and corruption which isn’t too far from the truth in fairness. That’s not to say everyone in America is along those lines but there’s no denying that many are and that’s what makes it so effective as an example. It echoes his tactic of using the truth in a particular way to better manipulate Lena from last week. In terms of the Red Daughter it’s a lot easier as she gets to see how people live in America and draws her own conclusions based on her skewed reading of the books Lex has supplied her with as well as a first hand example of that Lex wants her to see when she poses as a waitress. Her visit to Kara’s apartment is particularly telling as she sees the abundance of comfort and fully stocked fridge as a clear example of decadence. She likens Kara to a princess in a tower which makes for an excellent contrast to her own Spartan existence free of luxury. Lex also puts the idea in her head of them being sisters which makes Kara the selfish sister that abandoned her own flesh and blood to live a life ignorant of how little others have. She also can’t be entirely controlled as evidenced by her extreme reaction to loss involving her attacking and killing naval officers. Lex either expected that and pretended to be disappointed in her or expected this reaction from her though I see it as more likely that he was surprised that she was capable of lashing out so violently. It does also mean that his conditioning is working. Aside from a dodgy Russian accent Melissa Benoist’s performance is excellent. Red Daughter is very different to the standard Kara with a more stoic and less bubbly persona acting as a direct contrast to the warm enthusiasm in her performance as Kara. The Kasnian setting reflects this as it is cold and desolate against the colourful backdrop of National City. This helps promote the idea that Red Daughter is a product of her environment just as Kara is a product of hers. This will likely inform the conflict between the two Kara’s as one has had the opportunity to be free and make her own choices in life where Red Daughter has been manipulated into living a life that has been designed for her. There’s a tragic edge to her and I suspect that will end up defining her in relation to Kara. Lex’ plan is to reignite the Cold War so he can be seen as the hero that stops it. The Kaznian’s are another resource that can be deployed as he sees fit because he know what they want and exactly what he needs to do to make them believe that he’s the one to supply that to them. They are only useful to him because Red Daughter feels a sense of loyalty to them and they have resources that he can make use of. As soon as that stops being the case they will no longer be something he needs. Lex’ casual disregard for people he considers beneath him is certainly consistent. Lastly the beginning of the episode reveals that the Harun-El serum granted Lex powers which seems to put him on an even playing field with Kara. This doesn’t work for me as Lex Luthor has always been as intelligent as Superman/Supergirl is powerful so giving him the ability to match her in a fist fight cheapens him somewhat. With any luck the powers are a temporary side effect of the serum and he will go back to using his wits to combat Kara’s powers. This also probably means that James now has powers which is less than encouraging. An excellent episode that uses Lex Luthor as connective tissue to make the rest of the season feel joined up and offers a first rate showcase for his character. Making him the driving force behind the Red Daughter story works really well as it highlights his ability to manipulate both situations and people to further his own agenda. The way he conditions the Red Daughter to see America in a certain way is so strong as there’s more than an element of truth to it. The comparison made between how Kara and Red Daughter live their lives sets up the conflict between them nicely and established their alternate perspectives. Melissa Benoist plays Red Daughter really well and makes her feel distinct from Kara despite the familiar traits that are used differently. Her attachment to Alex without having the context is a great baseline for trusting Lex due to the coincidental similarity between the names. Lex himself in this episode is brilliantly calculating and secures himself as a strong addition to the show. Giving Lex powers is something that I could have lived without as the point of the character was to be as intelligent as Superman/Supergirl is powerful so having abilities cheapens that somewhat. It also looks likely that James now has powers which is less than encouraging. Another issue is making Eve out to be a Lex Luthor fangirl. Her intelligence is still clear and it’s great to see her confidence in challenging him but I would have liked to see her working with Lex for her own reasons outside of admiring him.